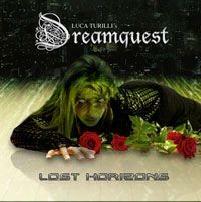 Luca Turilli's (Rhapsody of Fire 's composer and guitarist) new band/project, first album was released early June 2006 and is called "Lost Horizons". Luca plays the keyboards on it, the singer isn't revealed (she's called "Myst") though many people think she's Bridget Fogle, a female singer which can be also heard in the choir for the Dutch Band Epica or rumours suggest that it is Floor Jansen from After Forever. The guitarist of this project is French man Dominique Leurquin who is also Rhapsody's live guitarist.